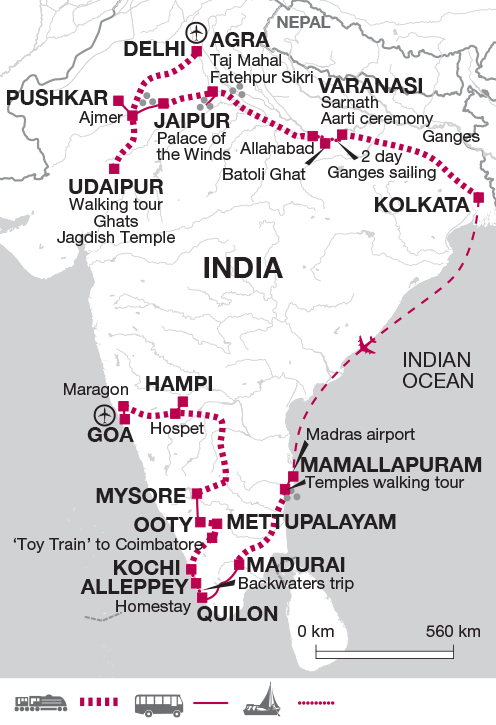 Combine both North and South India on this month long trip which explores the country in depth. From the hectic Northern cities steeped in Moghul architecture, religious sites and impressive palaces to the lush scenery, relaxed vibe and cool climates of the Western Ghats, this trip covers all aspects of this fascinating country. Our tour begins this afternoon in the bustling capital of Delhi. Our hotel is located in the Karol Bagh district of Old Delhi and home to a large market and interesting streets perfect to stretch our legs and soak up the sights and smells of India. This morning you have the opportunity to join a guided tour (optional) to see the sights of Old Delhi. A great way of travelling around this city is by metro or cycle rickshaw (please note that these transport costs are an additional cost).This former capital was founded in the 17th century by Moghul emperor Shahjahan. It includes a magnificent blend of architectural splendour and vibrant chaos, the very image of an Indian city all of which is centred on the bustling Chandi Chowk Bazaar. On this tour, you'll see the bazaar and the spectacular Jami Masjid Mosque, the largest in India and Shahjahan's magnificent swan song. We will meet back at the hotel later to then transfer to the Nizamuddin station where we will board an overnight train to take us to the beautiful lakeside city of Udaipur. Arriving early this morning, we travel to the hotel by taxis/auto rickshaws. Once settled in, we will explore this city on foot. Set before the serene backdrop of forested hills this is without doubt one of Rajasthan's most elegant and sublime settings: a city of temples, palaces and gardens that is considered by many to be amongst the most beautiful in the state. Founded in 1559, by Maharaja Udai Singh II, today it encompasses some of the finest architectural examples of Rajput design and excess anywhere in India. Your tour will take in the lakeside ghats and the dhobi wallahs, who come down to the shore to wash clothes before the setting of Udaipur's regal grandeur. We will also visit the intricate carvings of the Jagdish Temple, home to a black stone image of Vishnu as Lord of the Universe, before moving on to view the exterior of the City Palace, one of Udaipur's most iconic buildings. Over the next 2 days there will be ample opportunity to re-visit some of these places in your own time. In a state filled with testaments to a golden age of Indian nobility, the City Palace is the largest of its kind in Rajasthan, a magnificent edifice of towers and cupolas, halls and balconies that overlooks the waters of Pichola Lake. There is the option today to visit this extraordinary setting. Other possibilities for today include a boat trip on Lake Pichola or you can hire a bike and venture into the surrounding countryside. This is a great way of seeing the contrast in local life between the village and city. Other alternatives further afield include visits to the Eklingi Temple, whilst a sunset cruise on Lake Pichola, presents this idyllic setting in all its glory. Please be aware that during the dry season the water levels on the lake can drop considerably, and in the event of a poor monsoon season can dry up completely. A morning train takes us on to the city of Ajmer, a famous Muslim pilgrimage centre that is home to the tomb of a 13th century Sufi saint. Our train should get us into the city around lunchtime. From here we then drive by jeep to the nearby town of Pushkar, an important Hindu pilgrimage place which is the setting each autumn for one of the most famous camel fairs in Rajasthan. Set besides the shores of Lake Pushkar, to the north-west of Ajmer, this tranquil little town is one of the oldest in India and is referred to as one of the 5 sacred dhams of the Hindus, boasting one of the few temples to Brahma - the Hindu god of creation, that can be seen anywhere on the planet. This afternoon has been left free to enjoy at your leisure. For those that wish, this morning offers a chance to take a hike up into the nearby hills to watch the sunrise from the Savitri temple (optional). Dedicated to Brahma's first wife, the temple lies at the end of a long series of steps that run behind the Brahma Temple and from its lofty vantage point the views out across to the lake and the surrounding desert offer a breathtaking setting from which to watch the arriving dawn. The rest of the day is then free to explore a little more of Pushkar, taking in its lake or visiting some of its colourful bazaars, before the opportunity to take a late afternoon optional camel safari out into the desert. Catching a local bus this morning we head for the fabulous \ Pink City\ of Jaipur, a city steeped in the rich heritage of the Rajput princes. The journey should take around 3 hours and on arrival we will transfer to the hotel by taxi. Being the capital of the state of Rajasthan, Jaipur is considered by many to be one of the finest planned cities anywhere. The usual Indian urban chaos is replaced with wide streets and formal gardens. This afternoon we have planned an orientation tour of this city on foot, following which you might like to take in the unique majesty of the Hawa Mahal, the famous \ Palace of the Winds\ , whose extraordinary facade of red and pink sandstone towers some five storeys above the city streets. Other options include the remarkable 18th century observatory of Jantar Mantar, the fascinating creation of Maharaja Jai Singh II, which houses a collection of astronomical instruments capable of measuring time to an accuracy of 2 seconds, including the largest sundial in the world. Another alternative is a visit to the opulent splendour of the City Palace, a rich fusion of Moghul and Rajasthani design that houses an armoury and a museum that is home to a dazzling array of costumes, manuscripts and inlaid grandeur. This morning there's the chance to pay an optional visit by taxi or rickshaw to the once mighty Rajput capital of Amber and its magnificent fortress. Lying at the mouth of a rocky mountain gorge, overlooking Maotha Lake, the fort is a stunning creation of white marble and red sandstone that contains a dazzling mix of Hindu and Muslim ornamentation, including the breathtaking mirrored halls of the Sheesh Mahal. Today it presents visitors with a staggering insight into the lives of the Rajput rulers. The rest of the day is free for personal activities. An early morning transfer to the railway station sees us catching the train to Agra, once the capital of the Moghul Empire. Littered with some of the country's most opulent and spectacular buildings, Agra provides a perfect setting for some fascinating sightseeing. The rest of the day has been left free to enjoy at your own pace. One option for the afternoon is take an optional tour of the abandoned city of Fatehpur Sikri. Founded in 1569, it was for a brief time the capital of the Moghuls under Akbar the Great. However, the city was then deserted just 16 years later following the emperor's death. Today it remains a ghostly testament to the majesty and power of 16th century Moghul India and presents a perfectly preserved example of an imperial court. This morning we make an early start and take a rickshaw ride to visit one of the most universally recognised buildings on earth; The Taj Mahal. Built by the emperor Shahjahan to honour the memory of his beloved wife Mumtaz, it was once described by Rudyard Kipling as 'the embodiment of all things pure'. Built of marble and decorated with the most exquisite inlay work, it required the labours of 20,000 men and is estimated to have cost something in the region of 3 million rupees (at today's prices around $70 million). Here, you can watch the sunrise over this iconic masterpiece before breakfast, after which the rest of the day is free to enjoy as you wish. You may also like to visit the city's imposing fort, whose grandeur and importance has seen it inscribed on the UNESCO World Heritage List. Another recommendation is the exquisite Itimad-ud-Daulah on the east bank of the river, a 17th century tomb built for the Emperor Jehangir's chief minister, which mirrors the marble majesty of the more famous Taj Mahal (hence its rather apt title of 'Baby Taj'). There is also a possibility of returning to the Taj Mahal, to watch the sunset later this afternoon, before we catch the overnight train to Allahabad. Please note: There is currently a restoration project taking place at the Taj Mahal, which involves applying a mud pack to the outer walls of the monument. In order to carry out the work, temporary scaffolding is being erected around the minarets and portions of the main dome. The work is being carried out in phases and is expected to continue until January 2017. We arrive in Allahabad in Uttar Pradesh early this morning and, after a chance to freshen up in a nearby hotel, we continue by road to Batoli Ghat on the shores of the sacred Ganges. Boarding our boats in the afternoon, we then begin our two day journey to Varanasi, drifting downstream in traditional crafts towards the historic walls of Chunar Fort. Overlooking the waters of the Ganges, the fort is steeped in five centuries of Indian history, providing us with a fascinating place to stop and explore, before we continue on to our simple overnight camp on the sandy beaches that line the banks of the river. Two-man tents, foam mattresses and blankets are all provided - we recommend that you bring your own sleeping sheet or lightweight sleeping bag. We set sail again this morning, passing through a rural landscape of timeless villages and ageless landscapes and on towards the holy city of Varanasi. We hope to stop at the school in Sherpa village, before ending our journey at the Asi Ghat in Varanasi, from where we transfer to our hotel by taxi. One of the oldest Hindu pilgrimage centres in India, Varanasi is believed to be one of the oldest continuously inhabited cities on earth with its age making it contemporary with the ancient Thebes and Babylon. Lying on the banks of the scared River Ganges, it is steeped in the lore and traditions of Hinduism, and since its inception as one of the principal centres of Shiva worship some 1200 years ago, it has attracted devotees from across the world to its myriad of temples and ghats. Believed by many to be the place where the material and spiritual worlds cross, countless thousands come here to cleanse themselves along the banks of the Ganges and partake in the rituals of Aarti. This evening there should be an opportunity to attend an optional classical music performance. This morning there is the chance to take an optional dawn boat ride along the Ganges. Here you will see the city bathed at first light and pilgrims performing the puja ceremony to the newly awaking sun. Or you can make a trip by taxi to the nearby site of Sarnath - one of the holiest sites in Buddhism. This is where the Buddha preached his first sermon following his attainment of enlightenment. This remarkable site is home to the Dharmarajka Stupa and the Dhamekh Stupa, the spot where Buddha first adopted the teachings that were to form the very principles of the Buddhist faith. The entire area constitutes the most expansive collection of Buddhist temples and monasteries on earth and represents one of the four holiest Buddhist sites in the world. Late afternoon in Varanasi provides the perfect opportunity to enjoy an evening sunset boat ride along the sacred Ganges, hopefully catching sight of the local priests performing the revered Aarti ceremonies. Varanasi can boast some 80 or so riverfront ghats, including a number of 'burning ghats' where public cremations take place along the water's edge. Please be aware that photography is forbidden at the cremation ceremonies. Today is a free day to explore. You may like to take the time to see the old city and the river-front by taxi, bicycle and rickshaw, or perhaps immerse yourself into the eclectic mayhem of the city's narrow streets and alleyways, a truly unforgettable experience that provides an incredible insight into traditional Indian life. Later this afternoon board an overnight train to Kolkata. Once the capital of British India, Kolkata (Calcutta) has had a turbulent past. It was central to the struggle for Indian independence and thousands of Bengali refugees came here at the start of the 1900's. It is a city of striking contrasts and can be overwhelming initially, but the unusual sights, pungent smells and the chaotic sounds of the country's second largest city are an experience unique to India. Arriving early morning, the rest of the day is free to explore. You could visit St John's Church and the many historic Raj buildings around Dalhousie Square. Or you can take in the Jain and Kali temples or the magnificent marble dome of the Victoria memorial, which is where the grandeur of European and Mughal influences come together in a blaze of white marble. There is also the flower market and clay modeller's village of Kumartuli, where the potters spend all year creating a wealth of images and idols for the annual festivals. Today we leave north India and fly south to Chennai. After collecting our bags we exit the airport and make our way to Mamallapuram, set 2 hours along the coast from Chennai on the shores of the Bay of Bengal. Mamallapuram was the chief harbour of the Pallavas Kingdom some 1200 years ago and a number of superb examples of its masterful carvings still exist in the so-called pagodas (actually 'rathas'). This morning there's the option to take a tour with your tour leader to view some of the areas most celebrated structures, including the 7th century Shore Temple - a UNESCO World Heritage site - and Ajuna's Penance, the world's largest bas-relief and one of the most impressive friezes in India. Although both have suffered at the hands of centuries of natural erosion, a remarkable amount of detail still remains amongst the carvings. We will also explore the fascinating reliefs of the Mandapa Cave temples and the Five Rathas, 7th century monolithic temples that were sculptured out of the very rock that surrounds them. The rest of the day is then free to enjoy some of the many attractions of the area, perhaps relaxing on the beach, or exploring by foot or bicycle. Another day in Mamallapuram offers the opportunity for some more personal exploration, with the chance to visit the either the nearby sights of Pondicherry or perhaps the Hope Foundation School at Pudipattinam. Pondicherry offers a charming mix of French colonial and Tamil heritage, whilst the school at Pudipattinam has been supported by Explore since the 2004 tsunami and is an inspiration to all who visit. Following dinner this evening we transfer to the railway station to catch the overnight train to Madurai and the cultural heartland of the Tamil and Dravidian cultures. Arriving very early this morning, the rest of the day is free for sightseeing. Some of the options available include the stunning Tirumalai Nayaka Palace and the 16th century Meenakshi Temple, whose imposing gopurams (monumental gates) and dominating towers rise above the chaotic exuberance of the seemingly endless throngs of pilgrims. Another possibility is a visit to the exquisite Hindu Temple of Brahadeswara, a World Heritage site that encompasses some 400 years of the Chola Empire and includes within its main shrine the largest Lingham (the sacred Shiva fertility symbol) in India today. You may of course just wish to wander Madurai's vibrant streets, soaking up the colour and noise of its many bazaars and perhaps searching for a bargain or two amongst its myriad of craft and carpet shops. Quilon lies in India's beautiful southwest, amongst the lush landscapes and hidden chan-nels of Kerala and this morning a private bus takes us across the Cardamom Hills, towards the glittering waters of the Arabian Sea. The journey will take us a good part of the day, covering some 260 kms and crossing the cool foothills of the Western Ghats, through an ever-changing landscape of plantations and verdant greenery. Quilon itself lies along the shores of Ashtamudi Lake and has long been a major trading centre in this region. Indeed, this was one of the earliest centres of Christian activity in the region and provides us with our gateway into the remarkable natural beauty of India's Arabian coast. This morning we will cruise through the Backwaters by public motor boat from Quilon to Allepey, a journey time of some 8 hours and the perfect way to observe the colourful comings and goings on the waterways. Boats are the villagers' lifeline, acting as taxis, mail delivery, school buses and even cargo vessels. You may see great pyramids of coconuts or even the odd buffalo being carried along in this time honoured fashion! Along the narrow channels the industrious villagers survive on narrow spits of land, keeping cows, pigs, chickens and cultivating vegetable gardens. Even the shells from the fresh water mussels are burnt to make building lime, and coir is used for just about everything. This evening we stay in a traditional homestay, a fantastic opportunity to learn more about life in the Backwaters. In the late afternoon our hosts can organize a trip by traditional canoe. Continuing north today, we head for the bustling port of Kochi (Cochin) by private bus. With a beautiful natural harbour that earned it the title of 'Queen of the Arabian Sea', Kochi, as you might expect, was founded on trade, originally with the arrival of Jewish and Arab spice traders in the first century AD. Its prosperity and importance increased even more with the arrival of the Portuguese in the 16th century, to be closely followed by the Dutch and the English, an eclectic heritage that helped produce a fascinating mix of styles and influences. This afternoon we will enjoy a short orientation tour around Fort Kochi on foot. You can find the oldest church and the oldest synagogue in India amongst its winding streets. We will take in the architectural charm of the Church of St Francis, where Vasco do Gama was buried for a while, as well as the port's famous cantilevered Chinese fishing nets. Today is left free to explore at your leisure. Fort Kochi is the oldest European settlement in India (1500), with a mix of English, Dutch and Portuguese architecture, making it a fascinating city to wander and discover either on foot or by auto-rickshaw . The Mattancherry Palace was built by the Portuguese in the 16th century, but extensive renovations by the Dutch some hundred years later earned it the name 'The Dutch Palace' and today it houses some of the best murals in India, depicting scenes from the Ramayana and other great legends. There is the option of taking a ferry across to nearby Ernakulam, or perhaps visiting the sumptuous grandeur of the Tripunithura Hill Palace, the impres-sive former residence of the Maharajas of Kochi. Kochi is also home to the famous Kathakali dance, thought by some to be the very essence of the culture of Kerala, por-traying as it does events from the great Indian epics of the Ramayana and Mahabharata. Its origins may have come from traditional temple rituals and from an art form known as Koodiyattam. It is the face make up which makes this dancing so unique and dancers can take up to three hours painting their faces - the features are heavily emphasised as it is the facial expressions and co-ordinated eye movements which are important in the dance. This evening there may be an opportunity to view one of these remarkable performances for ourselves (optional). A morning train to Coimbatore takes us back across the Western Ghats, towards the old hill stations of the British Raj. After the short train ride we switch to a bus and drive the remaining distance to Ooty. Today we take a short circular journey on the 'Toy Train' the only rack and pinion railway in Asia. Pulled by steam and crossing forested hills and girder bridges, the blue and cream carriages hark back to a golden age of engineering, when seemingly no hurdle could halt the ever-expanding British Empire. The railway itself can boast an interesting array of statistics, including a gradient of 1 in 12, no fewer than 208 curves and an impressive 13 tunnels. Given the terrain over which it has to negotiate it is also probably the slowest train in the country, averaging just 10.5km an hour. Whilst traditionally the Toy Train was pulled by steam engines these days they are mostly pulled by diesel engines. The rest of the afternoon is free to explore something of Ooty's natural and colonial charms at your leisure. Departing Ooty today we take a public bus north, to the city of Mysore, famed for its silk and sandalwood as well as its Dasara festivities. The so called 'City of Palaces', it was, until the middle years of the last century, the heart of the regal state of Mysore. Today it is renowned as the cultural capital of Karnataka. Depending upon our departure time from Ooty, there may be time later this afternoon for some exploration of the city before dinner. Today there's a chance to visit some of the cities cultural highlights, including the sumptuous grandeur of the Maharajah's Palace. Originally built in the 14th century, the palace has undergone two subsequent re-buildings (the most recent being in 1912 when the palace was redesigned by the English architect Henry Irwin). Today it is an opulent mix of Hindu and British architecture, filled with stained glass, mirrored halls and a fascinating mix of the elegant and the gaudy. The Chamundi Hills that overlook the city are home to the towering Sri Chamundeswari Temple and the giant representation of Shiva's sacred bull, Nandi, which was carved from a single piece of rock in the 17th century and is one of the largest in the country. Later today we depart the city and board the overnight train to Hospet, our gateway onto the fabulous World Heritage sites of Hampi. Arriving in Hospet early this morning we continue on to Hampi by taxi. The flourishing capital of the Vijayanagar Kings between the 14th to 16th centuries, Hampi was once the powerbase of one of the largest Hindu empires in Indian history. The sudden destruction of the city, following the Battle of Taikota in 1565, saw it abandoned by its people, leaving behind a ruined city that, even today, still conjures up something of the spirit of its long departed occupants. This afternoon you can choose to explore something of the ruins, or just enjoy a stroll through the wonderful countryside that surrounds these ethereal structures. At its peak, Hampi was reputedly the size of Rome, with nearly half a million people occupying its city streets. Today has been left free to explore its numerous temples and monuments, one of the most remarkable examples of South Indian Dravidian architecture anywhere in India. There are the stunning carvings that adorn the temples of Virupaksha and Vittala, the sculptured pillars of the Ramachandra Swami Shrine and the wonderful two-storied Lotus Pavilion, all providing rich testament to one of the most powerful Hindu dynasties that ever existed. We catch another train this morning, crossing over the Western Ghats to Margaon in Goa, the one-time Portuguese colony on the Arabian Sea. Under Alfonso de Albuquerque, the Portuguese landed here in the 16th century, capturing the original Arab trade settlement and building a city festooned with gardens and fountains, monasteries and churches, most of them sadly now gone. Goa became a rich source of trade, bringing east and west together to trade pearls and rubies, exotic spices and Chinese porcelain. This eclectic mix of cultural influences has had a marked effect on the region, with Catholicism still firmly entrenched and the Portuguese custom of afternoon siestas still widely practised in the heat of the afternoon. Food too plays a big part in Goa's heritage, with pork vindaloo being a particularly popular dish and the locally brewed feni - a spine-tingling spirit made from coconut or cashews - providing a favoured tipple. A free day today, you may choose to tour a spice plantation or to explore Panaji, Goa's easy going capital; a friendly,sleepy town of narrow winding streets and whitewashed shuttered houses. The Malabar beaches here are very long and very white against the turquoise waters of the Arabian Sea and close to the capital you can find the superb beaches of Gaspar Dias and Dona Paula. Please be aware though of the strong undercurrents that can make some of these offshore waters dangerous. It is also possible to explore the beautiful Goan countryside by bicycle. Agra - Rickshaw to Agra Fort (return) 200 INR Entrance fee to Agra Fort 300INR Rickshaw to 'Baby Taj' 200 INR Entrance fee to 'Baby Taj' 110 INR Rickshaw to Fatehpur Sikri 10INR0 (one way) Fatehpur Sikri entrance fee 260INR. In general only lightweight clothing is needed during the day, but bring warmer clothing for the winter evenings in the North from mid November to mid February, (esp. December and January) when a windproof jacket and several warm layers are also recommended. Hotel heating arrangements in the North are not on a par with UK standards and from December to February thermals may be useful. and skirts should be avoided, since they attract unwelcome attention. Shoes must be taken off for temple visit and you must always cover up arms and legs when going inside. You may want to take an old pair of socks to the temples as the floor can get very hot and difficult to walk on. One main piece of baggage and daypack. Remember you are expected to carry your own luggage so don't overload yourself. It is possible at most stations to pay porters to carry your bags to and from the train however please be aware that the costs can seem high in comparison to other services. Most train stations have several sets of stairs to reach the platforms. It is worth packing light so you can carry everything yourself. Tents (with mosquito screens), mattresses and 2 blankets per passenger are provided locally for the Ganges river camp - we recommend briging your own sleep sheet or lightweight bag. Bring a torch and a personal water bottle. Although entirely voluntary, tipping is a recognised part of life in this region of the world. Some local staff will look to members of the group for personal recognition of particular services provided. Accordingly you should allow approximately £30.00 for tipping. Several nights on this trip are spent on overnight trains. Although the sleeping arrangements are quite basic, this is a fun, economical and very authentic way to travel in India. We will usually be in 2 tier class which consists of two bunk beds in a four berth cabin, separated from the aisle by a curtain. Clean pillows, sheets and blankets are distributed to all passengers in the evening. The air conditioning can make the carriage very cold so it is a good idea to have something warm to wear in bed. Occasionally we will be in a three-tier carriage which is very similar to the two-tier, except there are three bunk beds each side and no curtain.